Wheelie bins in the Acocks Green Ward will be delivered during the month of October. However do not start using them until week commencing 24th November. A leaflet with all the information you need will be with the Wheelie Bin and a calendar of the new collection dates. From November our recycling and rubbish collections are changing. The council has recently been posting out information about the new wheelie bins. They will be delivered from October if your household has been deemed appropriate, having received a ‘Green Card’. Each suitable household will receive two wheelie bins, one for household rubbish and one, with separate compartments for recycling. 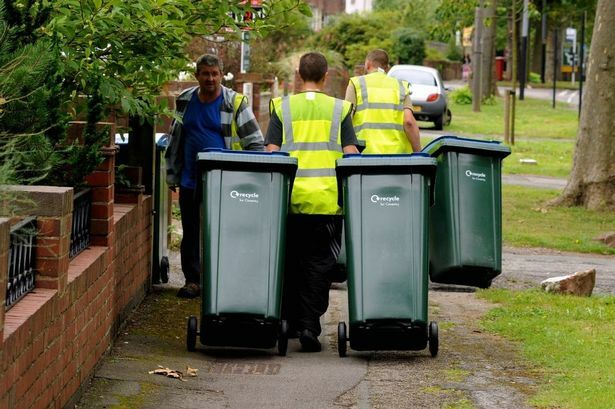 Wheelie Bin Deliveries will start from the end of September for up to 8 weeks for all suitable (green card) households. Each household will have 2 wheelie bins, (unless a request has been received for a second recycling bin from larger households) . Each bin will be fitted with a microchip that will be associated with the property address. Each bin will also be marked with an address label that states the house number to which it was delivered. An information pack will also be provided, including a collection time calendar, bin use instructions and information about the green waste bin collection service. New bins will be sealed with a tape which will remind residents not to put the new wheelie bins out before the start of the scheduled collection times, as shown on your calendar. Collection of old bins and recycle boxes – a date is to be arranged for the collection of your old dustbins and recycling boxes. Alternatively, residents can keep their old bins/boxes or take them for disposal at the Household Recycling Centres. Possible Change of Delivery Day – Because of the major changes to the service, there may be changes to your current collection day. You will be informed if this is the case when the bins are delivered. Non Wheelie Bin Properties – If you should receive a ‘red card’ which informs that your property is not suitable for wheelie bins there will be no change – you will remain and continue with black-bags/recycling boxes. -Blocks of high-rise flats will not receive a card. These properties are already on communal collection services with large containers and they will remain unchanged. -Houses in Multiple Occupation will receive an information leaflet which informs of what can / cannot go into each of their bins. There is currently a mix of collection services at such properties and the opportunity will be taken to standardise these as a communal collection service for both rubbish and recycling wherever possible. This will be carried out from September, separate from the main assessment and delivery of new wheelie bins. . Blocks of flats comprising 4-8 properties will also receive an information leaflet which informs them likewise. As these also have mix of services and the opportunity is being taken to standardise these on a communal collection service for both rubbish and recycling. This will be carried out on a bespoke basis during the autumn. This entry was posted in Events and tagged Acocks Green, recycling, rubbish collection, Wheelie Bins. Bookmark the permalink.